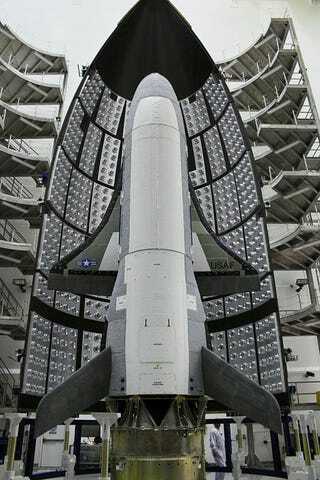 The secret is out (well, up): the X-37B preps for launch. The X-37B is the United States Air Force's semi-secret space plane. According to gizmodo.co.uk, two of these spacecraft exist, resembling miniature versions of the former space shuttles. While no civilians (and probably not a lot of the military) are aware of what the space plane is up to, it is known that they can spend a significant, self-sustained amount of time in orbit, with the last X-37B mission enduring 674 consecutive days circling the planet. Here's an infra-red image of it, because it looks more secret and cool that way. The space planes are currently not designed for manned missions, although it would be kind of awesome to think there was a secret astronaut program designed to act like NASA's version of the CIA in orbit. However, the space planes will be testing a new type of orbital thruster, which is critical for difficult tasks like satellite realignment. Known as the Hall thruster electric propulsion system, the new thrusters use electricity and xenon for propulsion, and might lead to the creation of more "agile" satellites if tested successfully. Little space plane, big mission. Also aboard are a host of materials science experiments, including over 100 different materials that are being tested against the rigors of space. Such tests help NASA to better identify what types of materials are best suited for future satellites, probes, telescopes, and other spacefaring projects. 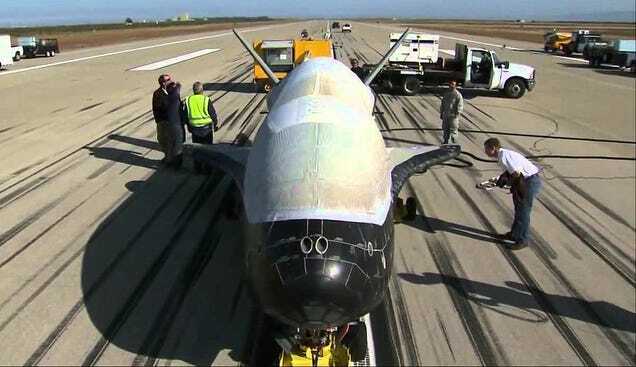 These "investigations" are among the first that are being conducted independently of the flight operations that concerned the viability of the space plane alone. "With the demonstrated success of the first three missions, we're able to shift our focus from initial checkouts of the vehicle to testing of experimental payloads," said Randy Walden, director of the Air Force Rapid Capabilities Office. The X-37B is also known as the OTV (Orbital Test Vehicle.) According to CBS, it is 28 feet long, 9.5 feet tall, and has a wingspan of 15 feet. On April 13th, it was awarded the Space Foundation's 2015 Space Excellence Award, "for significantly advancing the state of the art for reusable spacecraft and on-orbit operations, with the design, development, test and orbital operation of the X-37B space flight vehicle over three missions totaling 1,367 days in space." With an accolade like that, who'd want to keep things a secret? The X-37B will be returning to orbit on May 20th, launching on an Atlas V 501 booster. Safe spaceflight, you spectacular secret! due to X-37B stowaways trying to invade Earth? Shhh...that's still part of the secret.